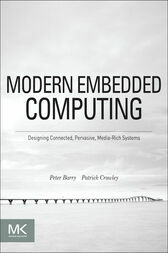 Modern Embedded Computing: Designing Connected, Pervasive, Media-Rich Systems provides a thorough understanding of the platform architecture of modern embedded computing systems that drive mobile devices. The book offers a comprehensive view of developing a framework for embedded systems-on-chips. Examples feature the Intel Atom processor, which is used in high-end mobile devices such as e-readers, Internet-enabled TVs, tablets, and net books. There is need for a good, comprehensive book on embedded design and the lab-based approach using the Intel Architecture is very good and practical.